I quite honestly could have stopped there and just had that be this week’s entry, but come on now, FishDuck doesn’t do weak sauce like that & neither do I! 1917. No that’s not the number of push ups Duckie has done this season (by the way the Duck’s name is Duckie not Puddles, Puddles was the original live duck mascot kept on the sidelines long ago, that’s your fun fact for the day!). 1917, no that’s not the combined weight of Wisconsin’s Offensive Line. No my Duck friends, 1917 is the LAST time the Ducks won a Rose Bowl, and 2002 is the only time Oregon won any BCS bowl game! Ouch…it’s been 95 years and counting since Oregon won a Rose Bowl, seriously are the Big Ten Opponents THAT much better than the Oregon teams that have lined up against the Ducks all those years? 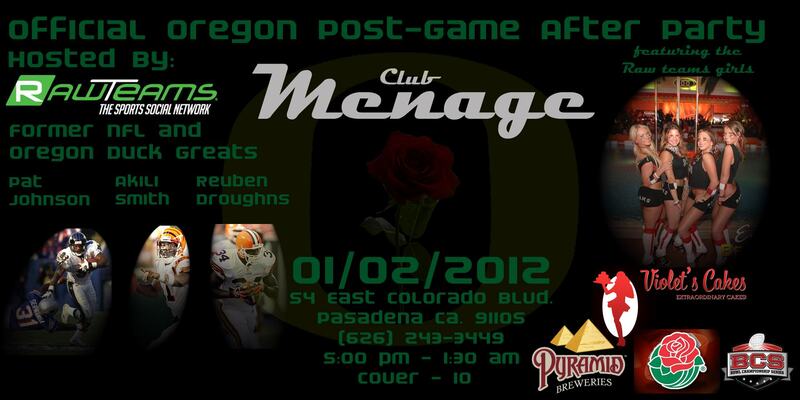 So Duck fans here’s the ugly truth, Oregon is 1-4 in Rose Bowl games and 1-2 in BCS Games. Will this Rose Bowl be the tipping point? Will it mark the beginning of a long list of postseason glory to come, or the start of the fall back to reality after the meteoric rise under Coach Kelly? I can tell you this much, if the same motivated Oregon Ducks team that showed up against Stanford takes the field on Jan 2nd, then Wisconsin seriously stands little chance and it may be a complete lambasting like it was on the Farm last month. However if it’s the misfiring Oregon Ducks team that played LSU and USC squandering opportunities and suffering self-inflicted wounds, well fellow quacker-backers we could all be in for a very long game. This in its entirety though has to be a very critical game for Head Coach Chip Kelly’s career. This year his team achieved their third straight outright conference championship, and third straight BCS Game invite. No doubt that the Ducks have been very impressive in conference games, only losing two conference games and two out-of-conference games, excluding bowls. Oregon is the only team in the country to make three straight BCS appearances. It’s difficult to ask for much more. Kelly is a mastermind, only two conference losses in three years is unprecedented success in University of Oregon history. So please don’t misunderstand, I am grateful and extremely happy that we have such an incredible coach, but Winning The Day also involves closing the season out like a champion. Games are defined by the final score when the clock hits zeroes, so too is a team’s season based on the results of the bowl game. While the Ducks have had remarkable success the last few years, the bowl performances have left behind a sour taste. I can’t completely describe the feeling at Autzen Stadium December 2nd as I watched the giant balloons filled with confetti explode throughout the crowd, the students and fans rushing the field and to see a trophy presentation with the Ducks that night winning the inaugural Pac-12 title. “This is what’s been missing…” I said to myself before making my way out of Auzten for the final time in 2011. Fast. Hard. Finish. is the sub-text that goes hand-in-hand with the motto Win The Day. “Finishing” has been the portion that has obviously eluded these incredible Oregon Teams the past 3 seasons. We all know the woulda-coulda-shoulda and what-ifs by now. If only LeGarrette Blount didn’t fumble the handoff kicking the ball into the endzone vs. Ohio State, or if Casey Matthews had held onto that easy pick six on the first play, or Pryor hadn’t completed a miracle 3rd down prayer. If only the refs had correctly ruled it a fumble by Cam Newton instead of incomplete pass, or correctly called delay of game before the 3rd & 10 run vs. Auburn, or correctly ruled Michael Dyer’s wrist as being down just like they had a week prior in the Sugar Bowl. The what-ifs and should-have-been’s can drive somebody nuts lamenting on the little things that have prevented Oregon from lifting a BCS trophy in triumph since the 2002 Fiesta Bowl. But Oregon’s history in the Rose Bowl and what-ifs go back further…what if Herman O’Berry had wrapped up Ki-Jana Carter on Penn State’s first play from scrimmage instead of letting him loose for an 80 yard touchdown to start the 1995 game, or if Oregon had been able to execute in the game instead of missing four field goals. Go back further to 1958, the previous time before the Penn State matchup that Oregon was playing in the Rose Bowl and ponder what if only Ron Stover hadn’t fumbled at the end of a 23 yard catch-and-run that would have set up Oregon near field goal range late in the 4th quarter of a 3-point game, 10-7. Before that, a missed field goal in the 2nd half of the 1920 Rose Bowl sealed Oregon’s fate against Harvard in a tragic loss, 7-6. Make no mistake, no one knows that this is a must-win game more than Coach Kelly, but as a fan, we really would like a Rose Bowl victory. Shouldn’t we as Oregon fans expect to win these days given the recent regular season success experienced with Kelly at the helm? Success breeds complacency, and Oregon may be a victim of its own success. On paper Oregon should be the better team on the field come January 2nd, the Ducks are favored by a touchdown, plus rumor has it Oregon will be once again debuting new uniforms for the national audience, this time reportedly with new Winged-O Helmets for the game, that alone should seal the deal! If the Ducks do win, that monkey of “not being able to win the big one” may get off their back, with a loss to Wisconsin the perceived stigma of losing in big games may never escape Oregon, or Chip Kelly. My predictions: Wisconsin might be the epitome of the Big-10 cliche of big cornfed road-graders wanting to grind it out in the trenches, but Oregon has proven that they can get past teams with bigger lines wanting to outmuscle the speedy but undersized Duck defense, just as Stanford. Where Wisconsin can not match Oregon is team speed, and it is a huge difference. If key offensive weapons LaMichael James, De’Anthony Thomas, Josh Huff, and Kenjon Barner are able to get the corners or allowed to move in space, Wisconsin won’t be able to keep up. Wisconsin’s defense has proven itself to operate at turtle pace if their games against Michigan State and Ohio State are any indication. If it’s one-on-one in the open field, the Badgers lack the foot speed to be able to match Oregon’s athletes. How will Oregon’s defense handle Monte Ball and the vaunted Wisconsin offense? How will Oregon limit Russell Wilson to being merely a pocket-passer? Wilson after-all fits the exact mold of Terrelle Pryor and Cam Newton, big quarterbacks capable of moving the chains with their feet when receivers are covered or firing a ball deep if the safeties creep up to stop the run, which has proven to be the thorn in Oregon’s side during the previous two BCS bowls. How will Wisconsin’s defense keep pace with Oregon once the Ducks start getting their athletes the ball in open space? All these questions and more will be answered in their entirety January 2nd 2012, around 2pm Pacific Time for certain, with Duck fans hoping that the what-ifs and shoulda-been’s don’t plague Oregon once more. Until then you’ll just have to deal with my prediction of Oregon 38-21. Have a safe and fun New Years everyone! 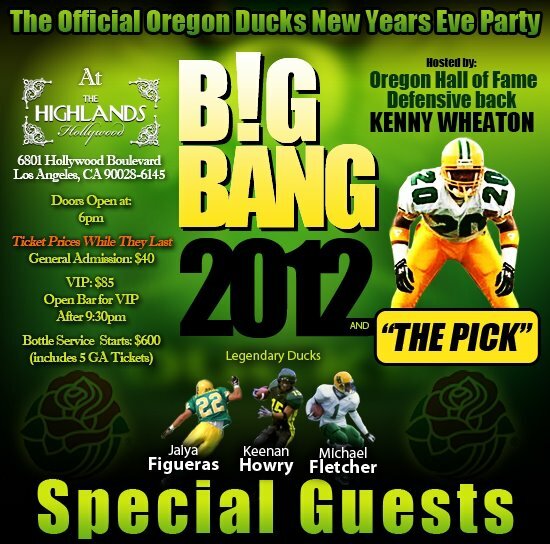 If you will be in Los Angeles, CA enjoying the Rose Bowl festivities, be sure to come party like a Duck with some Oregon legends and the FishDuck team on New Years, and don’t forget the pep rally on new years day on the Santa Monica Pier.